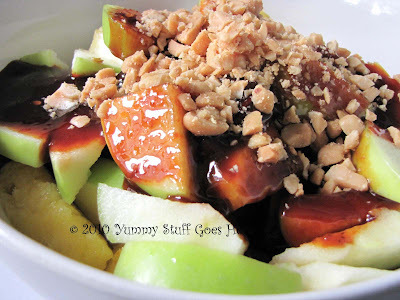 I tried this recipe today, I had to substitute a few ingredients as I can't find it here. So here goes. Of course I improvise a bit as I don't have everyything in her recipe..so my version tasted not too bad actually. 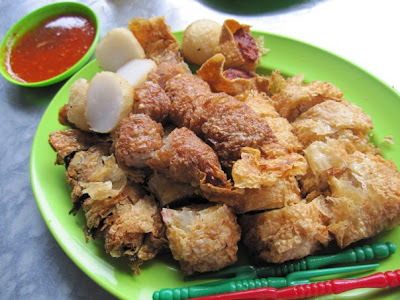 Not as good as the one by Ayer Itam in Penang but very yummy indeed. I used Basa fish fillets and Japanese rice udon noodles as I can't find rice sticks here. I really like my soup coz I put two cans of pineapple crushes in it and lots of hae ko in the soup base and also when serving. The mint leaves were fantastic, really bringing out the fresh taste. Any kind of fruits you like, some examples below. Hae ko ( shrimp paste) err, it looks black like molasses, taste of shrimp, made from concentrated shrimp. You can get this in any GOOD Asian grocer. In melbourne, try the Vietnamese grocer, bought it there once. Mix wet ingredients for dipping sauce. 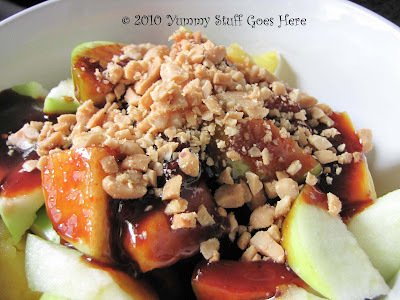 See, I have mixed up my rojak sauce to my bowl of fruits. Comic presentation only. Please do not eat the salt outside. I believe it is to ward off evil spirits? 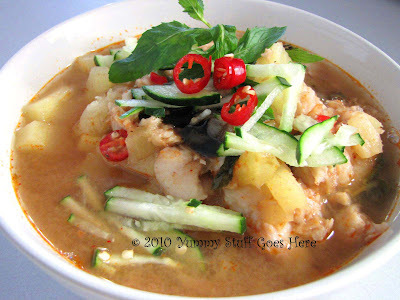 Hey all, I found this online, it will be good foodie trail resource if you are heading over to Penang. It would seemed that I must have forgotten about my motion sickness and bumpy plane rides recently because I am already thinking about my next foodie holiday. I will be going solo this time, the boy does not enjoy travelling....what is up with that? Maybe 3 weeks in KL was an overkill for him? How can I get him interested in culture & stuff? Poor kid was deprived of his online battles while being dragged around KL and Singapore by his mum. The only time he livened up, was at the malls and aquariums..Grrrr! Anyway, I finished unpacking my suitcase yesterday and went thru my bag of goodies. 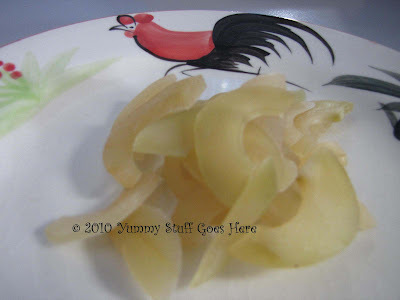 Today, I am enjoying some pickled nutmeg, a gift from a dear friend who lives in Penang. 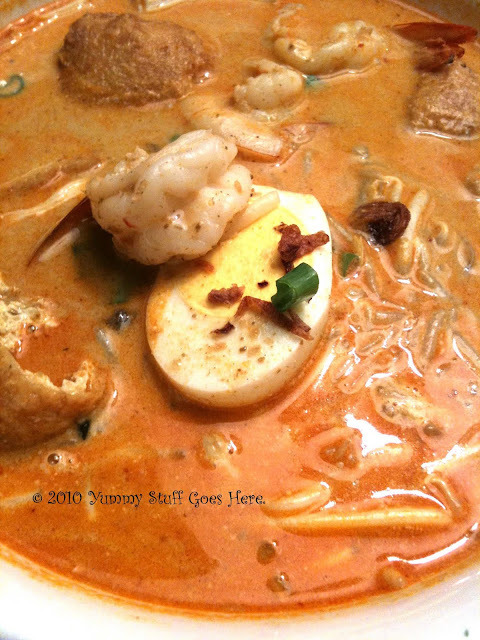 Penang has always been famous for its Assam Laksa, Char Kway Teow for example. 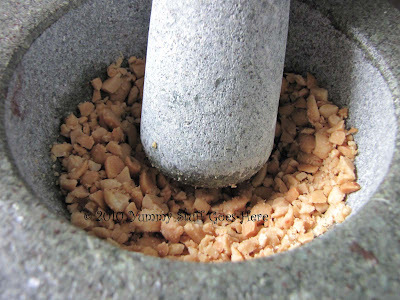 However, not many westerners are aware that Penang is also famous for its nutmeg. Below are pix of nutmeg on a cute plate that I bought overseas. Saturday afternoon, my sister picked us up and we went over to Pavilion for lunch. 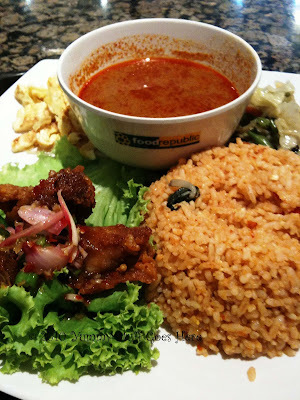 I had the best Thai food at lunch time at Pavilion for $11.00 MYR. That is like, a four dollar lunch in Aussie dollars! This is another massive food court. I prefer food court dining as I can get fast food for the boy and an Asian dish for myself. I ordered Set A which consists of Thai Fried rice, fried chicken, spicy sour soup and mixed stirfried veges. I also got a papaya salad on the side. The soup was delightful, sour and very spicy hot, almost like assam pedas. The fried rice and fried chicken was edible. 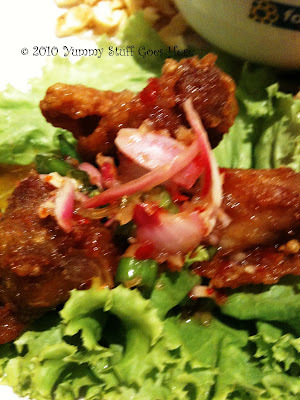 The chicken was crispy and chewy due to the deep fried marinated batter. 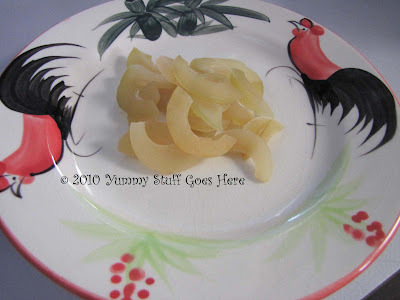 I love that it was showered in thinly sliced onions and fresh chillies with lime juice. 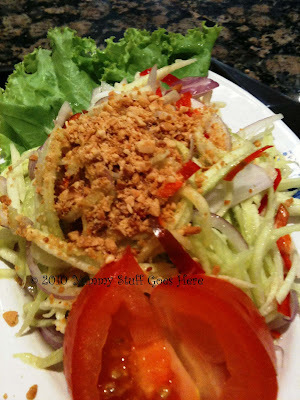 I especially loved the papaya salad as it was so refreshing and yummy. This is a very basic Thai meal. To my taste, it was the best meal ever in the food court category. 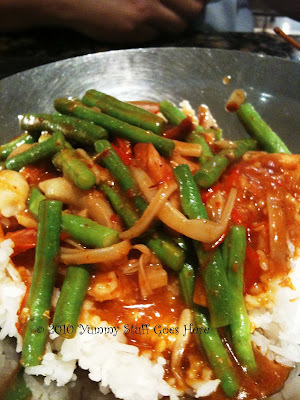 My sister ordered the green bean and seafood sambal dish from the next stall. 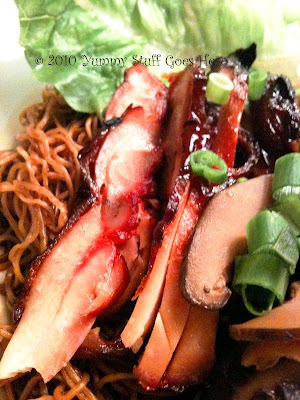 In all honesty, I am being very critical here as this is one of my favourite noodle but this dish was inedible. It was too salty from over saucing. 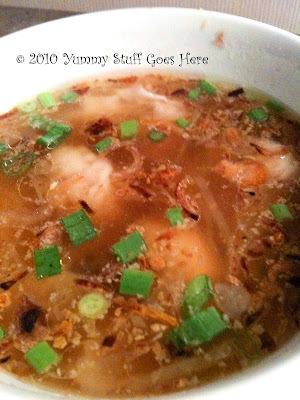 The prawn dumpling was beautiful but I couldn't enjoy the soup because it was too salty and oily. I ate it coz I was hungry. 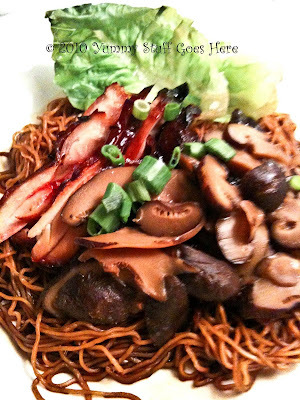 Given the choices and variety of noodles, it makes one wonders how this dish got featured in the in room dining menu. Very dissappointing. The meat by the way was chicken, no pork is served in this hotel. Fair enough, I am not a fan of pork. Really guys, how did this meal meet the standards? 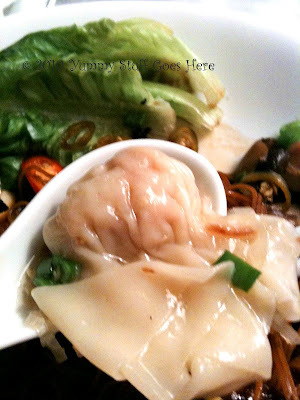 I should have put this on the not so yummy stuff list...the prawn dumpling was the best part of the dish. We went to KLCC for lunch today. 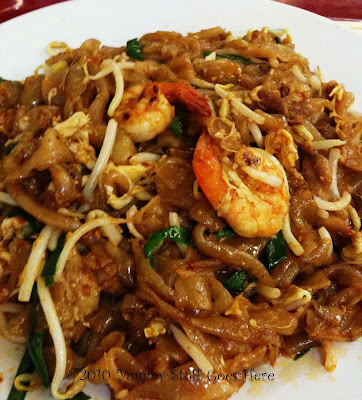 Had kway teow at the second floor food court. There was a huge crowd there but there were plenty of room coz the food court was massive. Anyway, the boy had McDonalds and I settled for a char kway teow from a Penang Food stall. It tasted alomost the same...was dissappointed that it didn't have any cockles in it! But yummy all the same. The food is halal so there was no pork in it.. which suits me fine. 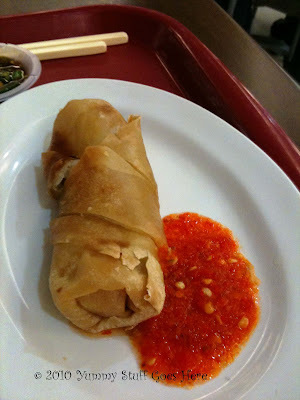 Oh yeah and I also had a spring roll.... ;) Yummo! Plus that my sore throat is gone...I just happened to be blowing my nose non-stop. Anyway, doesn't this clears up the sinus or something? Okay enough said... 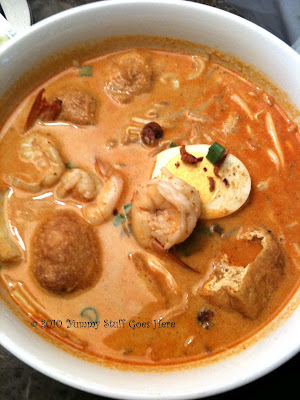 I must now present the laksa I had last nite, creamy with a kick. Super yummy... and clears up the sinus! It was 3 years after my late dad's passing and a very spontaneous spur of the moment school reunion that brought me back to old Sungai Patani town last weekend. Yes, I finally get to say goodbye to my late dad. After 26 years of not seeing the old school gang, we all met up at Chennai that nite. I am very grateful to our Lord that I am able to meet up with some of my most cherished and treasured school mates that I grew up with. Special thanks to the driver, my sister for driving us up there to SP. Below are pix of the old clock tower in the centre of town. 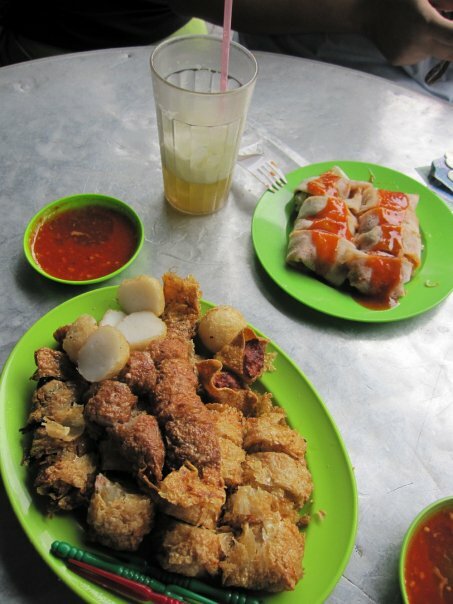 And some light refreshments from the local hawker centre. When we got there , we met up for afternoon tea with Karen. 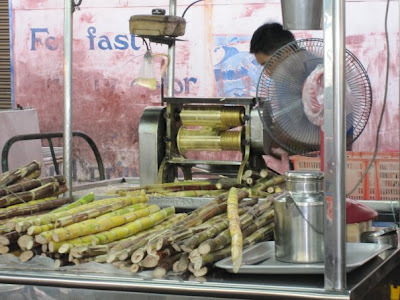 We had Lo Bak, Popiah and sugar cane juice. It was yummy and fantastic to catch up after all these years. Photos are courtesy of Karen Choo. I opted for something less spicy tonite due to my continuing battle with the sore throat... Anyway, it was very "ho chiak", very delicious, as one might add! 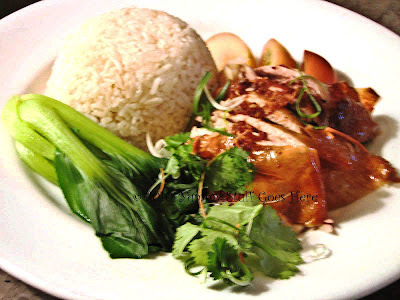 I love the fragrant rice and soup, so soothing...the roast chicken was especially yummy. Maybe ginger is bad for my throat too but I figured staying off the chilli tonite might helped. Hi all, been absent from blog for few days due to my travel back to my hometown. I had a small reunion with some of my very good friends from school. It was a blast, thoroughly enjoyable. The food was okay, nothing spectacular, the company was excellent! We were such a noisy bunch, it was funny and comical to see our old friends, we were transported back to Form Five. We looked a little older but our characters and traits are still the same. We opted for Chennai Restaurant which caters Indian foods. I was still suffering from sorethroat, it came back, maybe too much chillies? So I ordered some watermelon juice and the mint julep. It was veery cooling and refreshing. We ordered mutton briyani, naan breads, tandoori chicken, fish curry and vege curry and some other chicken stuff. I only took a few pix of the food coz the lighting was very dimmed in the restaurant. Our waiter Akhbar was very cute. He was totally hot! Yes, I definitely think Akhbar is Great!